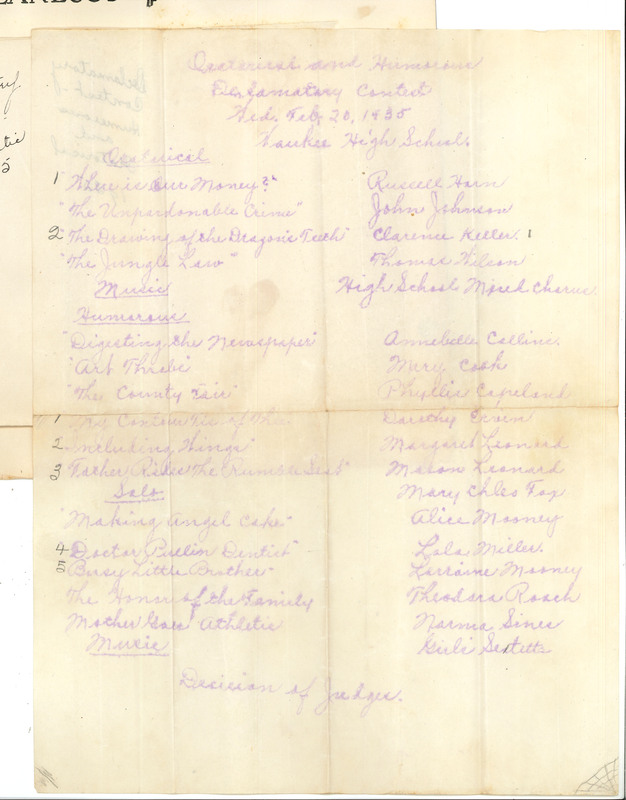 [Illegible] and Humorous [Illegible] Contest Wed. Feb. 20, 1935 Waukee High School. Oratorical 1. Where is our Money? Russell Horn "The Unpardonable Crime" John Johnson 2. The Drawing of the Dragon's Teeth" Clarence Keller "The Jungle Law" Thomas Wilson Music High School [Mirck?] Chorus Humorous "Digesting The Newspaper" Annabelle Collins "Art [illegible]" Mary Cook "The County Fair" Phyllis Copeland 1. My Con[illegible] Tis of Thee Dorothy [last name?] 2. Including Wings Margaret Leonard 3. Father Rilke The Rumble Seat Mason Leonard [Salt?] "Making Angel Cake" Alice Mooney 4. Doctor Pullin Dentist" Lola Miller 5 Busy Little Brother Lorraine Mooney The Honor of the Family Theodora Roach Mother Goes Athletic Norma Sines Music Girls Sextetts Decision of Judges.